In the twelfth century, St. Francis of Assisi (1181–1226) was credited with seeing an apparition of Jesus Christ (c. 6 B.C.E.–c. 30 C.E.). St. Catherine of Siena (1347–1380) reported seeing Jesus in the fourteenth century. The Catholic devotion to the Sacred Heart as a symbol of love was begun in the seventeenth century after an apparition of Jesus Christ had been seen by the French nun St. Margaret Mary (1647–1690). At the height of his illness in December 1954, Pope Pius XII (1876–1958) had a vision of Jesus in which the Savior spoke to him in "His own true voice." The Vatican kept Pius's revelation secret for nearly a year, then through the "affectionate indiscretion" of one of the Holy Father's close friends, the magazine Oggi broke the story in its November 19, 1955, issue. On December 12, the Vatican confirmed the remarkable disclosure, declaring the vision not to have been a dream. Sources near to the pope said that he had been wide awake and lucid. Vatican authorities said that there had not been a more vivid or specific vision of Jesus since the days of the Apostles than that reported by the pontiff. According to Church records, Christ had appeared to a pope only once before, and that was in the fourth century, when Pope Sylvester (d. 335) consecrated the mother church of St. John Lateran in Rome after Emperor Constantine had ended the brutal persecutions of the Christians. Although devout Christian laypersons occasionally report apparitions of various saints and the image of Jesus, by far the greatest number of apparitions of religious figures are those of Mother Mary. Pope John Paul II (1920– ) has proclaimed his firm belief that it was a number of significant apparitions of Mother Mary that brought about the end of communism in the former Soviet Union, thus fulfilling a prophetic pronouncement to one of the three children to whom she appeared six times between May 13 and October 13, 1917, in Fatima, Portugal. In his book Russia Will Be Converted (1950), John Haffert detailed a series of apparitions of Mary in the 1940s that began eroding communist doctrine and converting thousands to Roman Catholicism. In one instance, a young girl was said to have beheld the apparition of a beautiful lady who told her to return to the same spot for 15 days. After having received visions on each of these successive days, the girl was presented with the materialization of seven perfect rose petals. It was claimed that the petals did not fade or lose their fragrance. It was also said that a botanist declared that the petals could not have come from an ordinary Earth rose. ninth century, but "right now." 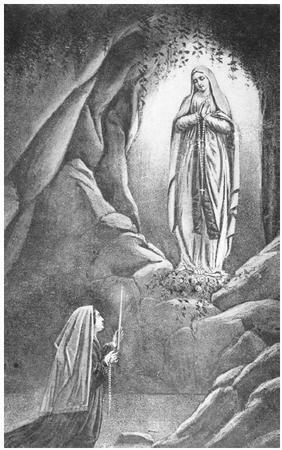 Matter stated that the interest in apparitions of the Holy Mother has been building for the past 150 years, "with more and more reports of visions of Mary in more and more places." Guadalupe, Mexico: In 1531, a Native American named Juan Diego saw Mother Mary four times and was given a miraculously created serape as evidence of her heavenly visitation. Paris, France: The Holy Mother appeared to a nun in 1830 and asked her to fashion a medal to commemorate the Immaculate Conception. La Salette, France: A weeping, sorrowful Mary manifested to two peasant children on September 19, 1846, and instructed them to do penance for their sins. Lourdes, France: Identifying herself as the Immaculate Conception, Mary appeared 18 times to 14-year-old Bernadette Soubrious between February 11 and July 16, 1858. The waters of the miraculous spring that appeared according to Mary's promise are world famous for their healing powers. Fatima, Portugal: Mother Mary appeared to three children near Fatima, instructing them to say their rosary frequently. During her six visits between May 13 and October 13, 1917, Mary issued a number of prophecies, many of which are said to be held secret by the Vatican. Beauraling, Belgium: Between November 29, 1932, and January 3, 1933, five children at a convent school experienced a remarkable 33 encounters with Mother Mary in the school garden. Banneaux, Belgium: Mother Mary appeared to an 11-year-old girl eight times between January 15 and March 2, 1933, in the garden of her parents' humble cottage. In addition to the above listed Vatican-recognized meetings with Mother Mary, there are a number of other encounters with her that have been highly publicized and may even be better known than many of those on the approved roster. time, the small village of Knock has come to be called the "Irish Lourdes." Garabandal, Spain: A series of ecstatic visions of Mother Mary began for four children one Sunday after Mass in 1961. The visitations continued until 1965 and produced numerous accurate prophecies and astonishing miracles. Zeitoun, Egypt: As many as a million witnesses may have glimpsed the figure of the glowing Madonna standing, kneeling, or praying beside a cross on the roof of St. Mary's Coptic Church. Miraculous cures manifested among the pilgrims from 1968 to 1971. Medjugorje, Yugoslavia: In 1981, six children saw Mother Mary holding the infant Jesus near the village. The holy figure appeared on an almost daily basis for five months, leaving behind a continuing legacy of miraculous healings. Bayside, New York: From 1970 to the present day, the "Bayside Seeress," Veronica Lueken, issues pronouncements from Mother Mary against the spiritual abuses of contemporary society. Conyers, Georgia: Since 1987, Nancy Fowler has been receiving daily messages from Mother Mary. On the thirteenth of each month, beginning in 1990, apparitions of Mary and Jesus began to appear. 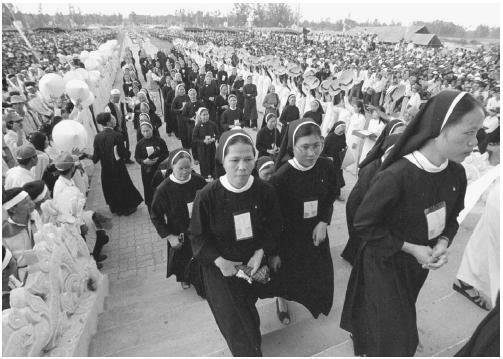 By 1993 as many as 50,000 pilgrims could be expected to gather for each month's demonstration of the divine. Hollywood, Florida: A devout Catholic who had fled to Florida from Castro's Cuba in 1967, Rosa Lopez was left bedridden after a series of painful surgeries in 1982. In 1992, after making a pilgrimage to Conyers, Georgia, Lopez received a healing miracle; and in 1993, Jesus manifested to her and proclaimed that she, too, had been chosen to be a messenger for Mother Mary. Soon the Divine Mother began conveying messages to Rosa Lopez to be shared with the thousands of faithful who gather outside her modest home. Roman Catholic scholarship holds that there are two kinds of visions: One is the imaginative vision, in which the object seen is but a mental concept or symbol, such as Jacob's Ladder leading up to heaven. St. Teresa of Avila (1515–1582) had numerous visions, including images of Christ, which Church authorities have judged were of this symbolic kind of vision. The other is the corporeal vision, in which the figure seen is externally present or in which a supernatural power has so modified the retina of the eye so as to produce the effect of three-dimensional solidarity. By no means are Roman Catholics the only Christians who have religious visions and see apparitions of holy figures. In October of 2000, a Lutheran minister and a sociologist in Minnesota released their study that more than 30 percent of 2,000 Christians surveyed said that they had had dramatic visions, heard heavenly voices, or experienced prophetic dreams. In April 2001, details of research conducted at the University of Wales detected a common core to religious experiences that crosses boundaries of culture and faith. An analysis of 6,000 such experiences revealed that Christians may describe a religious experience as an encounter with Jesus, Mary, or an angel; Muslims often interpret the phenomenon as the presence of an angel; and Jews describe the event as a sign of insight or an experience of God. author of The "God" Part of the Brain (1998), a book about the neuroscience of belief, goes so far as to declare that dogmatic religious beliefs that insist particular faiths are unique, rather than the results of universal brain chemistry, are irrational and dangerous. In his book The Faith of Biology and the Biology of Faith (2000), Robert Pollack concedes that religious experience may seem irrational to a materialistic scientist, but he argues that irrational experiences are not necessarily unreal. In fact, he states, they can be just as real, just as much a part of being human, as those things that are known through reason. Lorenzo Albacete, a Roman Catholic priest, a professor of theology at St. Joseph's Seminary in Yonkers, writes in the New York Times Magazine (December 18, 2000) that he is somewhat nervous about the new efforts of science to explain human spirituality: "If the religious experience is an authentic contact with a transcendent Mystery, it not only will but should exceed the grasp of science. Otherwise, what about it would be transcendent?" Daniel Batson, a University of Kansas psychologist who studies the effect of religion on people, states that the brain is the hardware through which religion is experienced. "To say that the brain produces religion is like saying a piano produces music," he commented. Numerous believers in the transcendent and in the possibility of experiencing religious apparitions argue that if God created the universe, wouldn't it make sense that he would wire our brains so it would be possible to have mystical experiences? Begley, Sharon. "Religion and the Brain." Newsweek, 7 May 2001, pp. 50–57. Delaney, John J, ed. A Woman Clothed with the Sun. Garden City, N.Y.: Doubleday, 1961. Sparrow, Scott G. I Am with You Always: True Stories of Encounters with Jesus. New York: Bantam Books, 1995. Steiger, Brad, and Sherry Hansen Steiger. Mother Mary Speaks to Us. New York: Dutton, 1996; Signet, 1997. I, myself, having gone through a very traumatic medical experience believe whole heartedly in the visions and miracles that can be performed by Jesus and Mary. In the hospital, awaiting a lung transplant, the time came for the surgery. My Pastor was there and just before I went in to surgery he wanted to pray with me and my family. I asked that we pray for the donor and not me as I felt the donor in more need of prayer. As the Pastor prayed with us i had a vision. I was standing behind Jesus who was sitting on a rock holding the donor in his arms, thousands of angels were all about him. This signified to me that the donor was being ministered to and I felt at ease as I has some guilt that someone had to die that ZI could live. As a little girl I distinctly remember entering one of the large Catholic Churches in Montreal in 1989/1990. 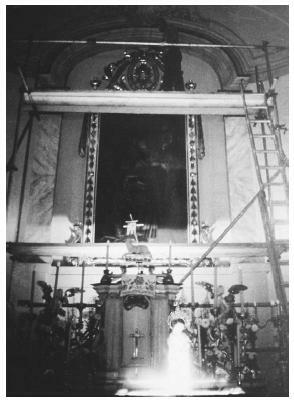 The crucifix was at the front of the church. As we walked up the aisle I saw Jesus' head turn down to look and me and he was crying. When I asked anyone else if they saw it, He was back in His normal position. When I looked up again, he was crying and looking down at me again. We were visiting the church as part of a protestant school class trip. After that experience I became a believer. Although I wasn't Catholic I knew that what I saw was real and even as a child I believed in what I saw and still do. People that experience it know and people who don't experience have a hard time understanding. When you see something like that you know that it's true and good and right. In response to the anonymous comment above, an apparition of Mary or Jesus can be real, because they are not God, they are simply holy figures who are messengers of God. Thank you very much, it is very interesting as usual.